Michael John Andrechak will join Emory as the university’s first chief university budget officer and vice provost on July 14. As part of a multi-year management succession plan of outstanding, long-term financial leaders at Emory, Michael John Andrechak will join Emory as the university’s first chief university budget officer (CUBO) and vice provost on July 14. 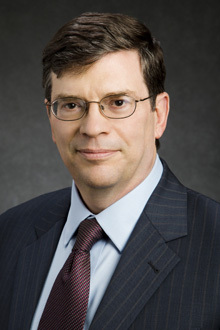 Andrechak brings more than 30 years of experience from the University of Illinois, where he served most recently as associate chancellor and vice provost for budgets and resource planning. In that capacity, he played a significant role in proactively addressing the financial challenges of the university and in planning major facility initiatives. He also partnered with the academic deans to align the financial resources of each college or school with academic priorities. A comprehensive process identified a dynamic and experienced group of candidates for the CUBO from a national pool, and a search advisory committee at Emory—co-chaired by Rich Mendola and Nancy Gourash Bliwise—helped narrow the field of candidates. Finalists met with leaders and key constituents throughout Emory this spring. In his new position at Emory—which reports to the provost and executive vice president of academic affairs—Andrechak will provide institution-wide guidance for budget and financial planning, along with serving as a consultant for the executive vice presidents, deans, and other senior administrative leaders. He will work in close concert with the future vice president of finance/chief financial officer (CFO), who will report to the executive vice president of business and administration, to help further advance Emory’s financial management structure over the next several years.